White Chocolate Candy Corn Bark! 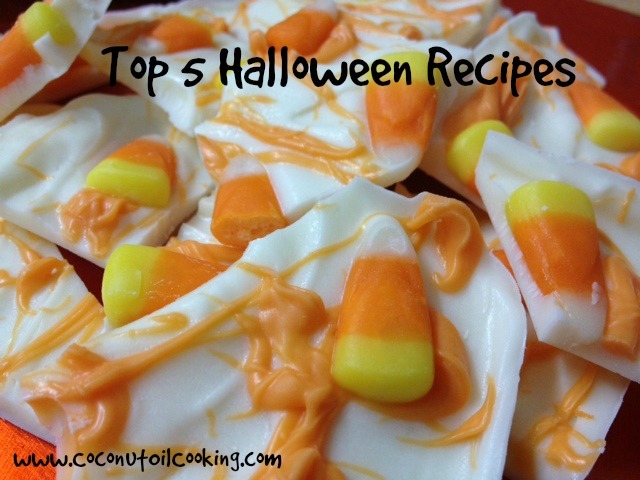 When I think of Halloween treats, caramel, apples and candy corn all come to mind. I’m already brainstorming of the sweet treats that I’ll be making this upcoming Halloween night (yes, I plan early). I absolutely love to entertain, so baking is a must in my household. I put together a list of my all-time favorite recipes that are fall inspired and perfect for this spooky event! All of the recipes that I’m listing below are made with coconut oil as a replacement for butter. Using coconut oil in baking is my go-to secret and I promise that you’ll love it. All of my recipes never come out dry or dense anymore – it has been a miracle! To use coconut oil in both cooking and baking, you simply replace the recipe in a 1:1 ratio. Coconut oil also contains medium chain triglycerides, leaving this healthy fat to be used immediately as an energy source once consumed. Alright now let’s get to the tasties! Here’s a list of my Top 5 Halloween Recipes – enjoy! Spider Web Mini Cheesecakes – These cheesecakes are so cute once finished and great for kids. The spider web itself is drawn out of chocolate frosting and you can choose to put your own twist on the finished cheesecakes as well. Plastic spiders or mini graves would be great added décor. White Chocolate Candy Can Bark – This recipe is beyond addicting – just a warning! Coconut oil melts white chocolate SO well, which is something I have always had a problem with in the past. The candy corn and white chocolate complement each other perfectly and looks so festive when displayed. I especially love making this bark for entertaining since guests can grab-and-go. Homemade Caramel Apples – Caramel apples are the perfect dessert for fall; I was always obsessed as a child. With this recipe, we made homemade caramel to cover the apples with. This is another great project for kids when it comes to covering the apples. Feel free to choose your favorite candies or cookies to add on top. Halloween Puppy Chow – When making this mixture, you can really get creative and add in your candies of choice. If entertaining, you can put out one large bowl or even make separate clear bags for party favors. This recipe is simple and takes no time to make – perfect if you’re in a time pinch! Salted Caramel Pumpkin Cookies – Okay, I couldn’t go without having the infamous pumpkin recipe!! These cookies come out absolutely amazing and have so much flavor to them. Anything caramel and pumpkin, you can count me in – yum! 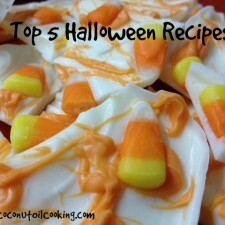 I hope that some of these recipes gave you ideas on what to make for this Halloween. Don’t forget, you can always use coconut oil as a makeup remover when it comes to that stubborn Halloween costume makeup!